This timeless classic continues to be popular with every generation! 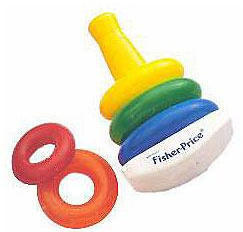 Rainbow of five teethable rings fits over a cone with rocking base. Size (inches): 7.48" X 2.56" X 10.04"
The Rock A Stack was delivered in a timely manner and in great condition. Thanks!